There a many reasons to be unhappy about the state of the environment. But we’ve recently found some good news: a conservation program that works. You probably haven’t heard of the Environmental Stewardship Program (ESP). It was a market-based agri-environment program that ran between 2007 and 2012, which funded farmers to conserve threatened ecosystems on their property. Land managers were given contracts for up to 15 years to deliver results. Overall, 297 land managers will receive about A$152 million over roughly 18 years to implement their conservation management plans. The last of these contracts will end in 2027. No new funding rounds are expected. There’s been a variety of market-based programs for conservation on farmland in Australia, but we don’t know what the total investment is to date. And we are not aware of scientific monitoring that demonstrates their impact. The box gum grassy woodlands of eastern Australia are home to several hundred species of native birds, including the iconic superb and turquoise parrots, thousands of native plants (such as the chocolate lily that leaves a deliciously rich and sweet aroma in native pastures), and beautiful mammals like the squirrel glider. 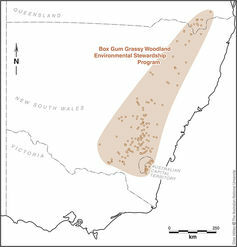 Box gum grassy woodlands have been 95% to 99% cleared for wheat and sheep grazing and are listed as nationally critically endangered. Box gum grassy woodland is found across eastern Australia. Author provided. 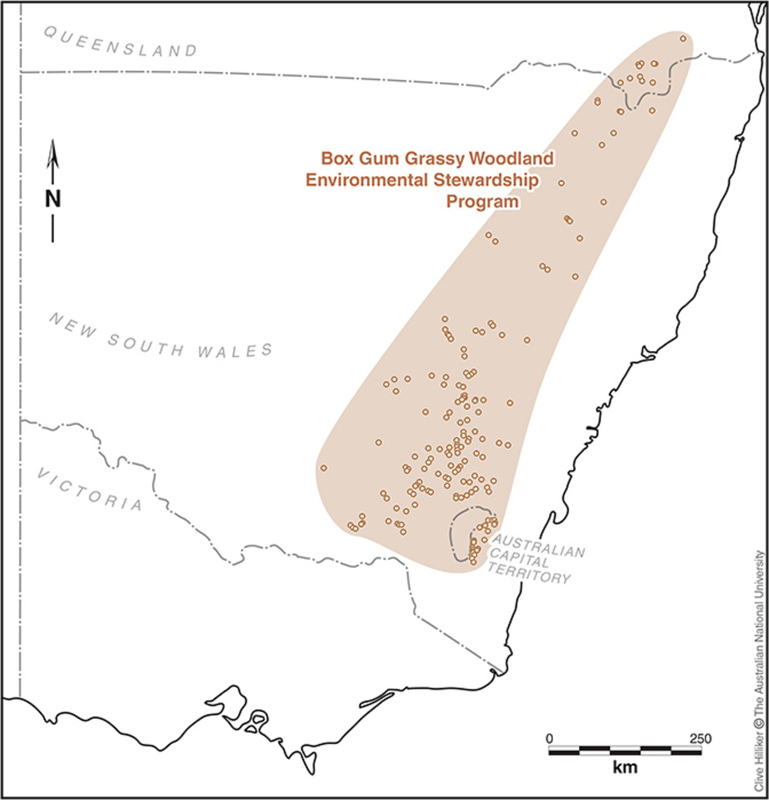 Under the ESP, more than 150 farmers from southern New South Wales to southeast Queensland have been funded to conserve the box gum grassy woodland ecosystem. This is one of the largest projects of its type in the world. Farmers undertake controlled grazing by livestock in woodland remnants, replant native woodland, avoid firewood harvesting, cease bushrock removal, and control weeds and feral animals. But we can’t know if a conservation program is working unless we monitor it. Fortunately, soon after it started, the Australian National University was commissioned to design a monitoring program for the ESP. We have now been monitoring these efforts for six years - and the results are exciting. So far, the data show that the farmers are doing a good job and it is money very well spent. To find out if the program is working, we have to compare managed (conserved) areas with “control patches” - patches where land owners haven’t done anything. This comparison shows that funded management patches have fewer environmental weeds, greater native plant species richness, more natural regeneration of native plants, smaller areas of erodible bare ground, and more species of woodland birds. In the space of six years, the Australian government, in concert with Australian farmers (through modest investment), has generated significant, positive environmental changes on farms. In fact, the box gum project can set the bar for many other conservation programs. The positive impacts go beyond improvement of the environment, because there have been notable social benefits too. Farmers are now highly motivated to deliver better environmental outcomes on their farms and showcase the integration of the multiple objectives of agricultural production and conservation. The income stream they received also helped some survive the almost unprecedented hardships associated with the Millennium Drought in the mid- to late 2000s. More generally, regular feedback and discussions between ANU field ecologists and landholders over the past six years has provided anecdotal evidence that farmers engaged in successful environmental programs suffer fewer problems with mental illness. This landholder goodwill and change in attitude towards land management is something that will far outweigh the 15-year investment in the program. Despite its success, the program has not been without detractors who see the policy and monitoring as over-engineered or boutique. This is primarily because its design, implementation, and monitoring standards are politically and bureaucratically inconvenient. They are not well suited to a reactive, short-term focused society. In the case of monitoring, some considered it wasteful to establish and monitor control sites (areas where there has been no management). Yet without the controls, we couldn’t tell this positive story. This is an exciting example of successful private-public land conservation and how it can be integrated with agricultural production (the primary land use of much of Australia’s land surface). The long-term funding model is a more sensible approach than one-off payments, and provides a realistic timeframe to achieve results. The Australian government should be congratulated and encouraged to invest in more programs of this type. It has worked because it was designed specifically to link farmers, scientists and policy makers. Billions of dollars are expended on the environment in Australia every year. Landscape recovery will span multiple governmental cycles and every dollar must be spent wisely. Programs like ESP give some guidance on how large-scale environmental programs can be more successful. Dan Florance, research officer, Fenner School of Environment & Society ANU College of Medicine, Australian National University is also one of the authors.